New England; HRV or ERV? I remember installing some early version residential Energy Recovery Ventilators (ERV) and discovering a potential freezing issue. Also, if I used only a Heat Recovery Ventilator (HRV) than I would be drying the air during the Winter, and adding significant latent load in the summer. So, which one do I choose? The homes are tight enough these days to require mechanical ventilation, and I would much rather a balanced ventilation system that I can control. An HRV works well for tight, moisture prone homes. This is because the unit can actually recover up to 85% of the exhaust air's heat, preheating the incoming fresh air. 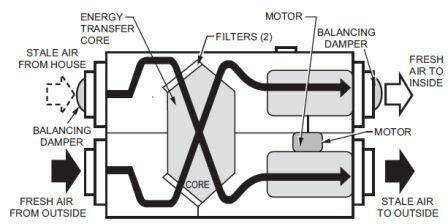 A small diagram from Honeywell shows how the air crosses paths on the core to cause this transfer, with as little as 10% contamination. Unfortunately, any ventilation in New England will reduce the indoor relative humidity in the Winter due to the cold, dry fresh air. This means that in the Summer, the very humid air can be tempered, but will increase the indoor RH and cause an increase in load on your air-conditioner. Since our part of the country sees approximately 2,500 run hours in heating, and only 500 in cooling, I would recommend installing an HRV on heating only equipment or tight homes with many occupants or latent load in the Winter. This means there was no need to install a humidifier! For those homes with an air-conditioner, or concerns about moisture control (too dry in the winter), than I would always recommend an ERV. An ERV not only transfers the heat, but controls a small amount of moisture as well. 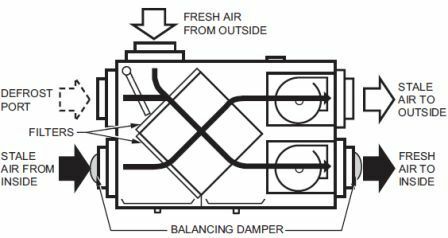 This will not remove the need for a dehumidifer, but will certainly decrease the load caused by your ventilation efforts. Those old freeze-up problems I saw on the early systems were addressed years ago with more integrated controls that actually sense defrost. If the temperature in these units get below 20F in the Winter, the fresh air damper closes to increase the temperature of the core and avoid freezing! The most important feature of the ERV is the moisture transfer. For instance, if the hot, humid Summer air was to enter the home or central a/c unchecked, this would increase the latent load of the unit and create a situation where the homeowner may be uncomfortable and turn off their ventilation. By removing up to 80% of this load, there is little tax on the central a/c. ERV's are most cost effective in extreme climates like New England. I would also install an ERV in a climate like Miami, extreme latent loads year round. Just remeber, it is not the outdoor climate that determines which unit to install, it is the indoor climate of the home and possibly HVAC equipment that decides which system is best! Cross-posted from the Excess Air Blog. Do the manufactures of ERV's certify that only moisture (H2O distilled grade) will transfer into the fresh air side and that water soluble toxins and aerosols remain in the exhaust stream?